A $100 million donation to flood-stricken Pakistan underscores the strategic importance Iran sees in courting its neighbour. When Osama bin Laden made a second plea over the weekend for Muslim countries to be more generous in their aid to flood-stricken Pakistan, he failed to mention one country that already has been—Iran. Last month, the Islamic Republic of Iran's leadership pledged $100 million to Pakistani flood victims in the form of reconstruction assistance, in addition to the tonnes of relief goods Iranian officials say are sent there every week. Yet this potentially key development has gone largely unnoticed by the international media. It shouldn’t, not least because the level of assistance is unusually large by Iranian standards. Indeed, it’s one of the largest aid pledges by the Iranian leadership to date. In a sense, and considering the magnitude of the disaster, this is to be expected—after all, Iran’s south-eastern neighbour is clearly in urgent need of humanitarian aid after a disaster the United Nations has declared as having exceeded the 2004 Asian Tsunami in terms of devastation wrought. But humanitarian considerations aside, there’s one thing that has been repeatedly clear in Iran’s post-revolutionary history—its leadership doesn’t pledge sums like $100 million unless it also sees some kind of political benefits to doing so. Iran is, of course, by no means alone in making such calculations—international aid frequently comes with strings attached, no matter who’s giving it. Yet there’s little doubt that with this move Iran is hoping to cash in on Pakistan’s frustration with the perceived slowness of Western countries to respond with aid—striking while the iron is hot to secure closer ties with its neighbour. It’s a smart and timely move. With the prospects for NATO forces in Afghanistan apparently growing bleaker by the day, and with a number of analysts arguing that the Taliban will have a considerable say in post-NATO Afghanistan, Pakistan is set to have considerable influence over Afghan affairs. Although Iran and Pakistan have traditionally been seen as competitors in the country, increased cooperation and an apparent rapprochement offers them the chance to split the spoils of NATO's departure in a more cooperative and less violent manner. In addition, by courting Pakistan, Iran will have more bargaining chips at its disposal in its dealings with the United States. Doling out money to Pakistan won’t, of course, guarantee influence. 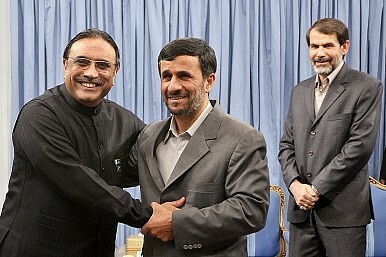 Many Pakistani politicians are suspicious of Iran's ambitions in Afghanistan. In addition, the country is ruled by Sunnis, many of whom are suspicious of Shiites—although there about 30 million Shiite Muslims living in Pakistan, constituting about 17 percent of Pakistan's population of 175 million, they are relatively weak politically. What Does Iran Really Think of China? Tehran has good reason to doubt that China is a reliable partner.